W. W. Norton & Company, 9780393351675, 448pp. The best-selling author of Seven Days in the Art World now tells the story of the artists themselves--how they move through the world, command credibility, and create iconic works. 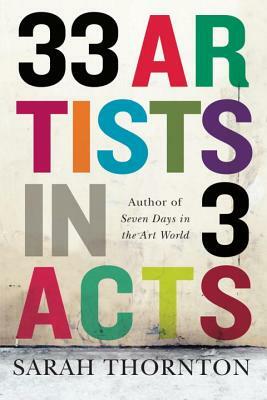 33 Artists in 3 Acts offers unprecedented access to a dazzling range of artists, from international superstars to unheralded art teachers. Sarah Thornton's beautifully paced, fly-on-the-wall narratives include visits with Ai Weiwei before and after his imprisonment and Jeff Koons as he woos new customers in London, Frankfurt, and Abu Dhabi. Thornton meets Yayoi Kusama in her studio around the corner from the Tokyo asylum that she calls home. She snoops in Cindy Sherman's closet, hears about Andrea Fraser's psychotherapist, and spends quality time with Laurie Simmons, Carroll Dunham, and their daughters Lena and Grace. Through these intimate scenes, 33 Artists in 3 Acts explores what it means to be a real artist in the real world. Divided into three cinematic "acts"--politics, kinship, and craft--it investigates artists' psyches, personas, politics, and social networks. Witnessing their crises and triumphs, Thornton turns a wry, analytical eye on their different answers to the question "What is an artist?" 33 Artists in 3 Acts reveals the habits and attributes of successful artists, offering insight into the way these driven and inventive people play their game. In a time when more and more artists oversee the production of their work, rather than make it themselves, Thornton shows how an artist's radical vision and personal confidence can create audiences for their work, and examines the elevated role that artists occupy as essential figures in our culture.